Looking more closely at the figures. The risk of a systemic crisis. The Fed at it again. The corporate debt crisis was adumbrated in a recent article of this commentator, but there is a plethora of publications on the subject that present diverging views that should be taken into account. A Bloomberg article reviewing the Deutsche Bank AG report on corporate debt prepared by the team working with Bankim (Binky) Chadha goes into detail about corporate debt as does an article by MATASII. The latter article synthesizes the Deutsche Bank report in much the same way as the Boomberg piece, but it is worthwhile taking a close look at the charts that are featured. The first chart illustrates the amount of corporate debt as a percentage of GDP but does not indicate net debt or the relationship of debt to profits according to Chadha. In any case one can see that corporate debt is over nine trillion US dollars, which is a hefty sum. When one considers the ratio of debt to profits, a different picture emerges. 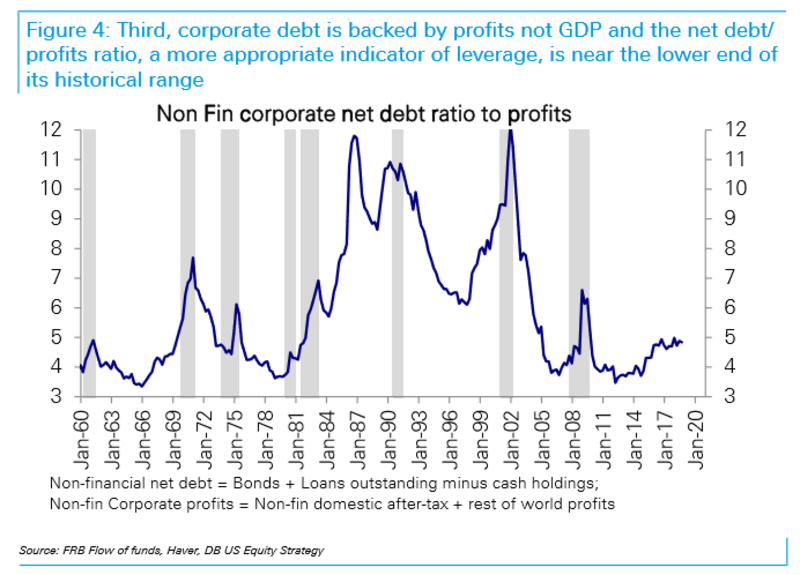 What is interesting here is that the net debt ratio to profits has varied greatly over the years. Since 2009, however, profits have hovered between 4% to 5% of debt. This is similar to figures from the 1960s and late 1970s as well as just before the GFC (Great Financial Crisis). 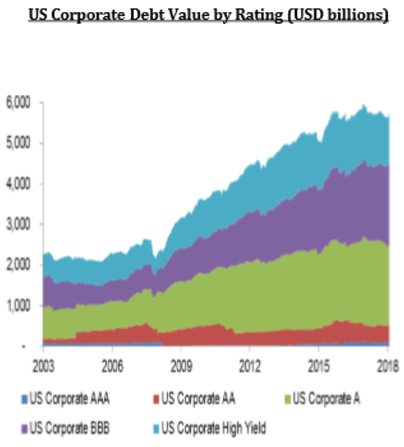 The difference is that the amount of corporate debt has increased markedly since 2009, and this is a reason for concern. Another aspect of the problem is leverage. 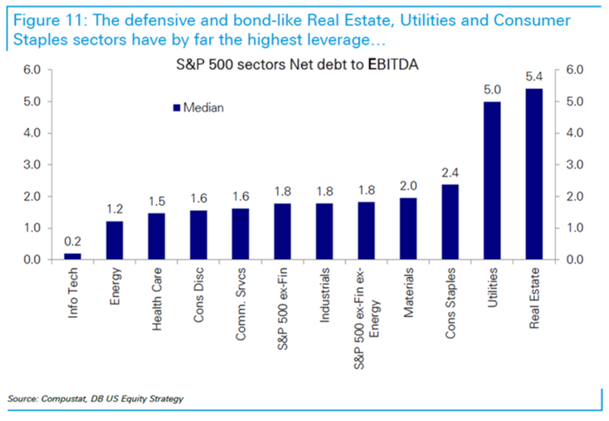 Chadha notes that Consumer Staples, Utilities and Real Estate have the highest leverage, but they are the more stable sectors. 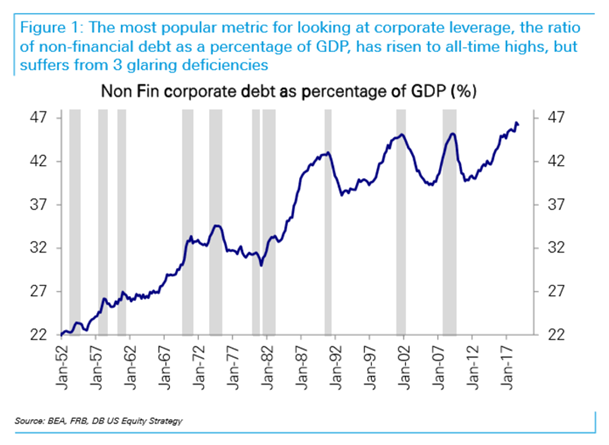 So he argues that the problem of corporate debt is exaggerated since the leverage is concentrated in the sectors that can handle it. Alessandra Scaggs in a Barron's article (8 March 2019) notes that Deutsche Bank says not to worry about corporate debt. But Chadha`s team did not look at all sorts of debt and many companies have fiddled with the EBITDA figures. So maybe the reassuring Deutsche Bank analysis is not to be trusted. In fact the argument is not very convincing. Enron is an example of a big company that went under. The real etate crisis of 2008/2009 is still fresh in the memory of many, and at the present time the reset in retail stores means that many shopping malls are going to suffer. One can turn this argument around and suggest that the sectors that are highly leveraged are those likely to have problems even if their cash flow presently is positive. Not every company in these sectors is guaranteed to come through a recession unscathed. The Bloomberg article goes on to ask why corporatons did not make such large debts in earlier years. The recent increase in debt is clearly to be seen. Andrew Lapthorne, Head of Quantative Equity Research at Societè Genèral, pointed out that the growth in corporate debt mainly occurred during the years of QE. It is not difficult to understand why the amount of debt contracted by corporations increased significantly during the QE years. Since the Fed lowered interest rates in order to save the economy and kept them at near zero (ZIRP = Zero Interest Rate Policy) or even resorted to negative interest rates (NIRP = Negative Interest Rate Policy), it was only too easy for corporations to borrow money,whether through loans or through issuing bonds. 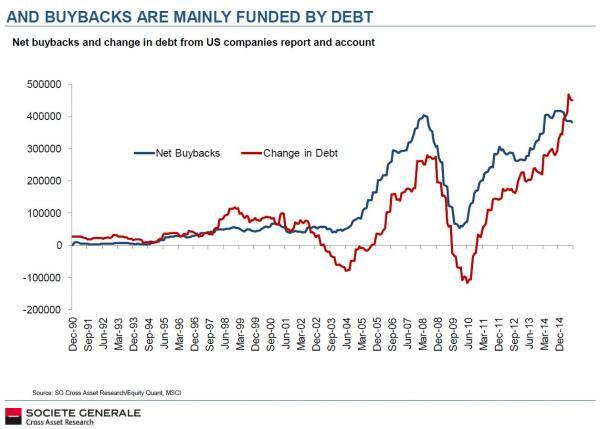 Lapsthorne also pointed out that buybacks had mainly been financed by debt. So a pattern emerges where one can see that the massive increase in corporate debt was matched by large sums being diverted to share buybacks. As was noted in the earlier article in Seeking Alpha, share buybacks do not strengthen a company and prepare it for an economic downturn. Financial engineering does not always help to shore up the economy. It may result in higher prices for equities, but that is not the be all and end all of the real economy. Another problem is that corporate debt has undergone a severe deterioration in the rating level of company debt. The graph below shows the increase in poorly rated debt from 2002 to 2018. There is hardly any AAA debt and not much AA. 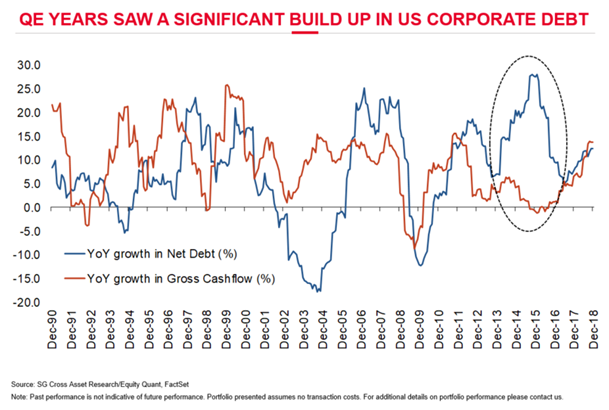 US Corporate A has increased significantly, but it is BBB and high yield that have seen the most important increases. This means that corporate debt on the whole has become much riskier than it was a decade ago. 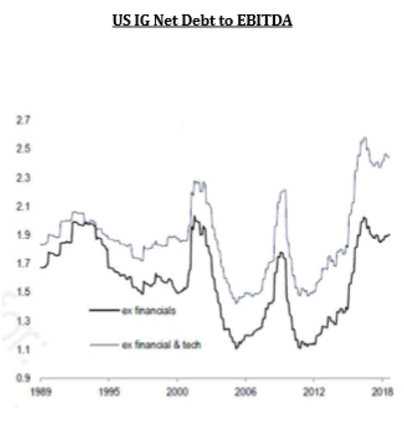 The graph indicates that there is reason for concern about corporate debt. When there is so much risk in the system, the danger of an increasing default rate is more acute. The systemic risk is much higher than it was in the past. 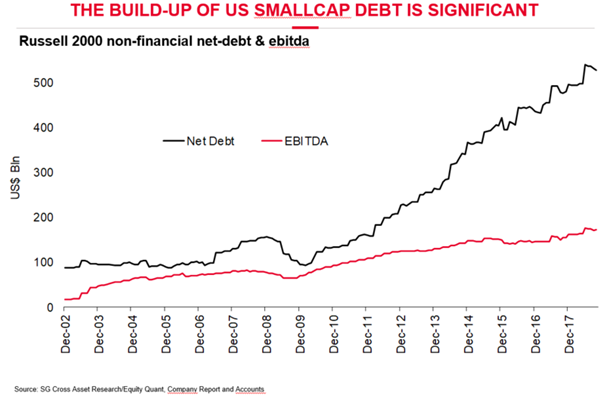 The Bloomberg article closes with a look at the debt of smaller companies, which is up to about 500 billion while their EBITDA does not seem to justify such a large sum of debt. The GFC (Great Financial Crisis) in 2009 marked the beginning of the assumption of large amounts of debt.The reasons for companies taking on large sums of debt has been outlined above. It remains to be seen how the Fed is going to act at this late stage in the economic cycle. If, as seems to be the case, there is going to be an economic slowdown that leads to a recession, the Fed can lower interest rates only so much since there is not much distance between 2.41% and zero. QE4 is a possibility, but statistics have shown that the effect of QE3 was limited. Buying stocks is a possibility that would mean the total end of price discovery in equity markets. Should the Fed insist with interest rate increases in H2, that will almost certainly bring on a recession and make the refinancing of the huge corporate debt problematic. The Fed is still busy reducing its balance sheet and currently plans to end the reduction effort in September. This decision is part of the Fed`s change of heart and new dedication to a dovish policy. It is extremely difficult at the present time to predict what possible scenarios might result from exacerbation of the corporate debt load due to decisions of the Fed. Further interest rate increases will make the debt load more burdensome while interest rate decreases will encourage corporations to carry on unperturbed with share buyback programs. The Fed is trapped between Scylla and Charybdis. "O captain, my captain!" The Fed`s fearful trip is not done. Additional disclosure: This article is for information purposes only. Investors are responsible for their investment decisions.